Tall ship racing is a unique maritime spectacle - not only does it feature magnificent sailing galleons from the golden age of sail but also crews made up of young cadet sailors. ‘Tall ships’ is a ‘catch all’ name for large, traditionally rigged sailing vessels. Tall ship races are such celebrated spectator events because these boats are often quite magnificent creations, especially when seen all together in a parade, and whose design harks back to a romantic era when sails ruled the waves. Tall ships commonly include topsail schooners, brigantines, brigs and barques. Entry is not reserved for the glamorous square-rig ships however. Any monohull sailing ship that is over 9.14m in waterline length, has a crew of at least 50 percent of between 15 and 25 years old and meets the Sail Training International’s safety standards is applicable. With such a backward looking premise, it is easy to think of tall ship racing as merely crowd-pleasing nostalgia parade for a forgotten and outdated age. However despite first appearing in Europe in the mid-20th century as way of marking the end of the age of sail, tall ship racing quickly heralded a new dawn of sailing and sail training. The European races gave rise to the creation of national sail training organisations around the world, and the development of numerous other races, training voyages, events and festivals for sail training tall ships. Sail Training Association was a non-profit organisation that was responsible for organising the very first tall ships race in 1956. In the subsequent years it has been responsible for the development and education of young individuals of every nationality, race, creed, culture and social background through their sail training experience. The charity organisation has since been renamed the Tall Ships Youth Trust, whilst a subsidiary group called Sail Training International has taken responsibility of the racing organisation. Every year sees a series of sail training tall ship races taking place all around the world, most of which are organised or endorsed by Sail Training International and their member national organisations. Tall Ships’ Races is an annual summer race series that occurs in European seawaters and comprises of two racing stages of several hundred nautical miles. 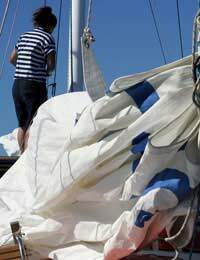 The racing vessels are largely manned by a trainee crew participating in the sail training programme. 50 percent of the cadet crew must be aged between 15 and 25. This last year featured two European races, one around the chilly winds of the Baltic and one in the somewhat milder climes of the Mediterranean. The Baltic race touched on four Baltic ports and featured over 115 tall ships from almost 20 countries, with around 6,000 young trainee crew members manning the decks. This unique and beautiful spectacle combined four days worth of activities in each of the ports with racing or ‘cruising-in-company’ between cities. Outside of Europe there is an irregular sail training tall ships race around the north Atlantic, as well as an annual ‘Tall Ships Challenge’ series, the location of which alternates between the Great Lakes, the Pacific and North America’s Atlantic coast, and races have been staged in the waters around Japan and Korea.